The modern kitchen (18 m²) is equipped with oven, microwave, dishwasher, hob, fridge with freezer, coffee machine, kettle and toaster. Of course, cutlery and crockery are available, as well as a small selection of spices. The bathroom has a bath, shower and toilet. Towels and hair dryer are available. The first bedroom (25 m²) has a double bed (1,90m x 2,00m) and a sliding door wardrobe. The second bedroom (18m ²) has the same equipment, cot can be set up on request. The living room has a TV flat screen and a Bluetooth speaker. An extra bed in the living room (0,90m x 2,00m) is possible on request. Wi-Fi can be used throughout the apartment for free. On our 6m ² large balcony you can end the day comfortably. We warmly welcome you in our beautiful modern furnished apartment in Traindorf, a district of the market town Heiligenstadt. The apartment is located directly on the bike and hiking trail and the entrance to the three mountain bike trails is located nearby (about 1km). A children's playground and football field can be easily reached on foot. The 95m² apartment on the ground floor has two double bedrooms, living room, kitchen, bathroom and balcony. Child or extra bed can be provided on request. Parking is available directly at the house and bicycles can be locked. WLAN of course free. You are welcome to use our large garden, to relax or for a barbecue with a covered area. We look forward to welcoming you as our guests. 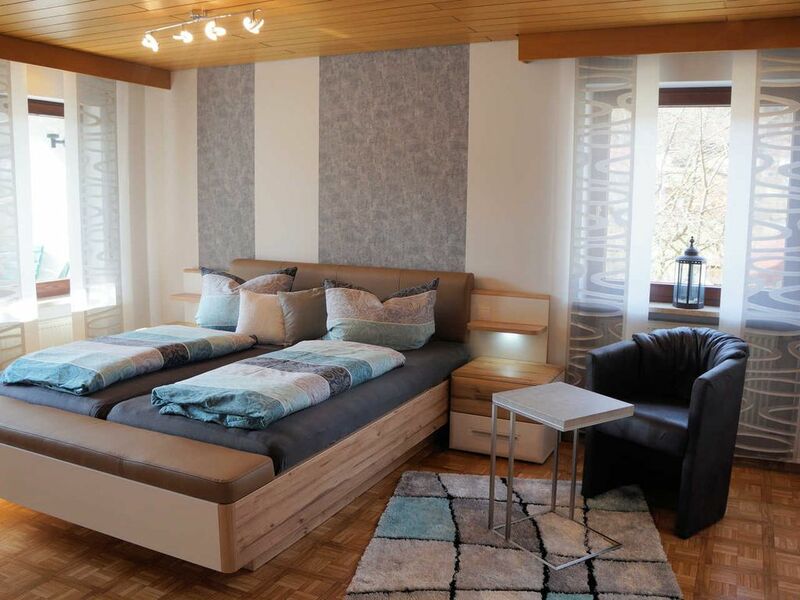 Sehr schöne lichtdurchflutete Ferienwohnung, sehr sauber mit moderner Ausstattung, sehr freundliche und hilfsbereite Vermieter. Es hat nichts gefehlt, wir kommen sehr gerne wieder. Uns hat es an nichts gefehlt. Sehr freundlicher Empfang. Wir haben uns bei Familie Lang sehr wohlgefühlt, jederzeit wieder!!! Tolle Wohnung, sehr nette und zuvorkommende Gastgeberin. Tolle Gastgeber, hilfsbereit und unkompliziert! Sehr geräumig, super sauber, alles vorhanden was man sich wünscht und das in grüner Umgebung... wir haben uns sehr wohl gefühlt und kommen gerne wieder! Traindorf is a district of the market town Heiligenstadt i. OFr. (District of Bamberg) and lies in Leinleitertal in the beautiful Franconian Switzerland and is thus a good starting point for many leisure activities. Biking and hiking trails lead directly past our property. The cities of Bamberg, Forchheim and Bayreuth can be reached in 30 minutes by car. In Heiligenstadt and the surrounding area there are shops and of course you can also pamper yourself in the inns or restaurants and enjoy the Franconian specialties. In summer, numerous beer gardens and cellars in Franconia invite you to linger. Holidays for everyone: cycling, hiking, Nordic walking, climbing forest in Veilbronn, Pottenstein Adventure Mile, sights (eg. Castle Greifenstein, ruin Neideck, etc.) or simply relax in the untouched nature.